San Francisco-based Simon Jefferson is managing director of leading digital agency, AKQA. He describes the company as an “ideas and innovation company”. He says AKQA exists to help its clients. “Our sole aim is to create the future with our clients”. 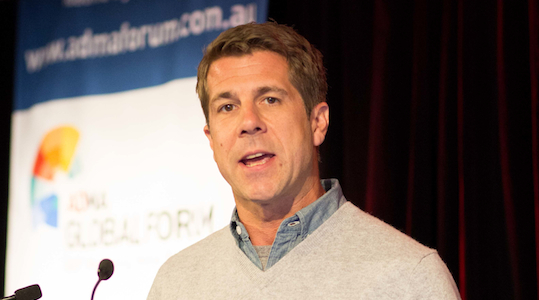 Jefferson was speaking at the ADMA Global Forum in Sydney last week. Of companies that endure and have endured over time, Jefferson says AKQA has identified five characteristics they all have in common: “They democratise, simplify, author, revolutionise and organise”. Companies such as Pepperidge Farm, the Ford Motor Company, Nike, General Electric, Chanel, Apple, Virgin and the visionaries who created them. Henry Ford, Thomas Edison, Coco Chanel, Margaret Rudkin and more recently Steve Jobs and Richard Branson. In the 1930s in the USA Margaret Rudkin created the Pepperidge Farm brand because her son was asthmatic and allergic to the standard bread available at the time. In the stock market crash in 1929 the family moved to Pepperidge Farm when her stockbroker husband lost his job. The idea of creating such a bread was considered impossible at the time. But not only did she achieve this, her bread was so good that the local doctor started selling it and exhorting his patients to eat it, even though it cost almost twice as much as a standard loaf of bread. Eventually the Pepperidge Farm company was bought by the Campbell’s Soup Company in 1961 and Rudkin was the first ever woman to sit on its board. By ‘democratise’, Jefferson says that innovative companies take what’s for the elite and make it for everybody; “They take what’s for the few and give to the many”. He gave the example of AKQA’s client Nike, and some of the work they have collaborated on. “Not everybody can afford a personal trainer. But with Nike Training Club, Nike has democratised personal training,” said Jefferson. There have been 21 million downloads of the Nike Training Club app. The app combines the use of motivation, rewards, training and becoming part of a large community and gives it to them in their pocket. “Coco Chanel democratised fashion, by liberating women from corsetry. The little black dress is probably the most democratic fashion statement that’s ever existed. And Apple’s usability has democratised computing. Whether you’re one or ninety-one their devices are super simple to use,” he said. Jefferson said you hear the terms ‘storytelling’ and ‘big data’ all the time. In an example of how his company combined the two for Nike, AKQA created a hundred thousand individual personalised animated videos that were sent to the most loyal Nike customers of Nike Plus Runners. They told their personal story using the athlete’s own data. And these acted as digital trophies that they could share with their friends and families. Companies that endure also revolutionise things. Jefferson said that lot of companies are trying to revolutionise their businesses. “But the best companies are not just revolutionary about their core business they revolutionise everything they do. Every aspect of their business”.